I have not kept this blog updated as we were busy moving from the hot humid south to our home in Oregon. We arrived just in time for the beauty of fall, my favorite season! The bounty of harvest, pumpkins, squash and apples! 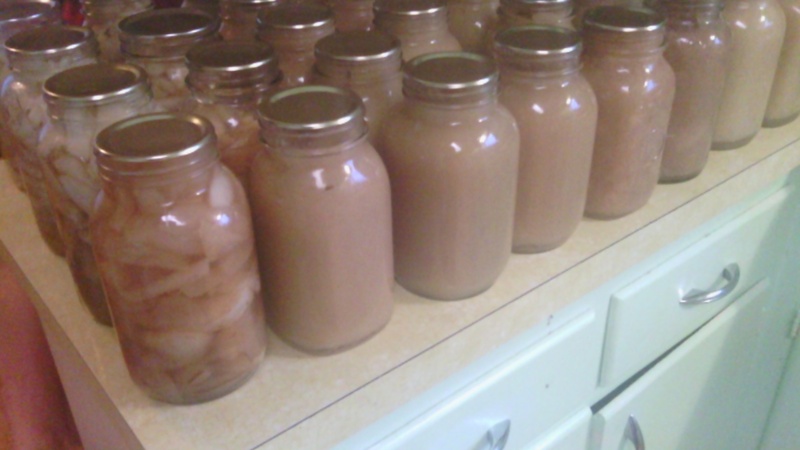 We could never have enough apples to preserve, my family will go through every jar of applesauce well before the season ends. It happens every year! Why so many apples you ask? Well for a myriad of reasons! First, unsweetened smooth applesauce is a wonderful replacement for oil in recipes! Use it to replace all or part of the oil in your favorite cake or bread recipe. This will make it a bit more dense and more moist so beware of that, however we love the texture even more. This is especially good in carrot or spice cakes and muffins! 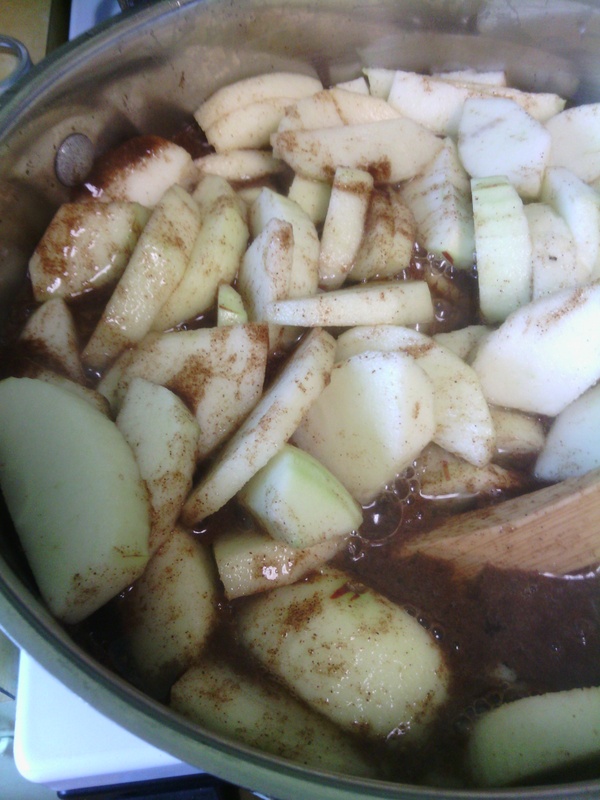 Then we always do some chunky applesauce mixed with cinnamon for eating with meals. This is great with breakfast, alongside a pork roast or baked chicken! I don’t add sugar or sweetener to applesauce but some people do. Feel free to add honey, sucanat, rapadura, brown sugar or granulated. You get to decide! Isn’t that fun! 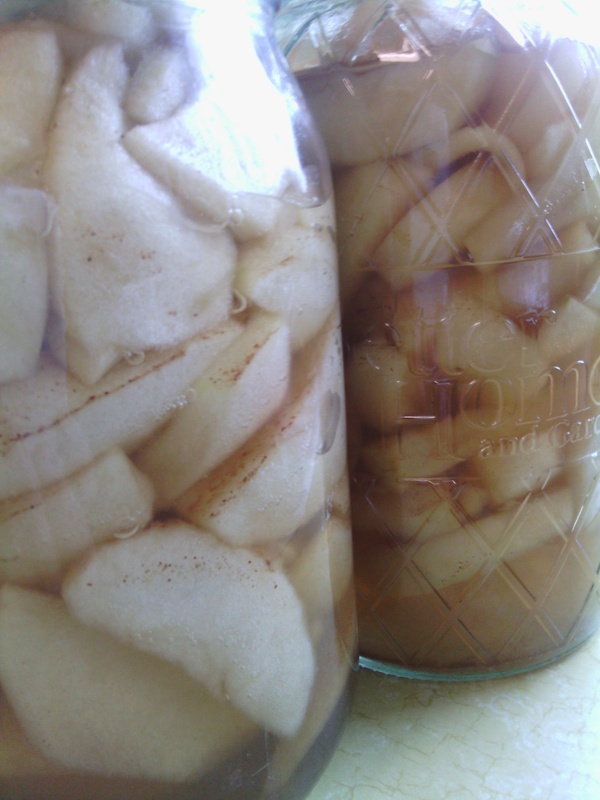 Finally we do several jars of apple slices in sugar and cinnamon. I used to do these with clear jel and you can do that that too! I personally didn’t enjoy the texture as much so we stopped mixing them with a thickener. Also, we like these for layering into cakes, putting into pancakes or waffles or mixing into muffins so we don’t always want them thick. 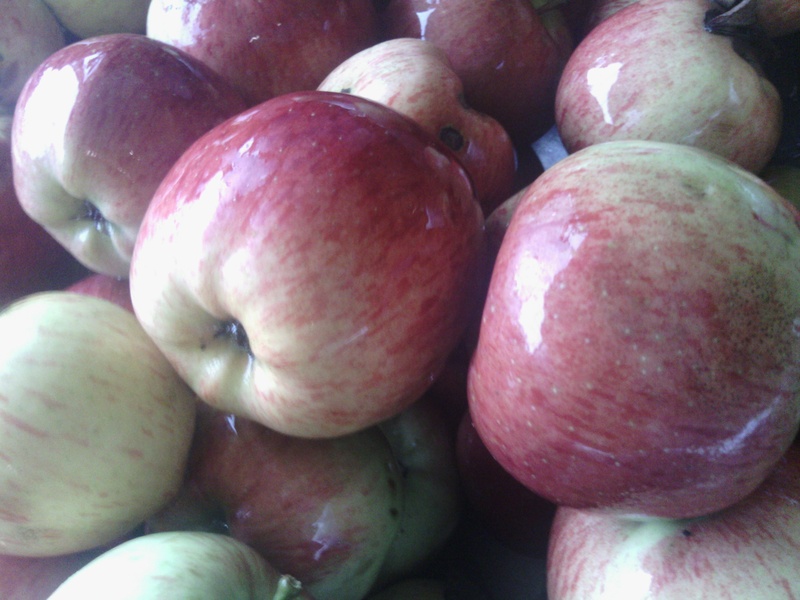 There is much discussion on what apples are the best for eating, cooking, saucing and preserving. You can easily google that and get more information then you will ever need. Here is the “mom in me” version. The best apples are free or cheap apples. For the last twenty years I have gleaned apples from abandoned orchards, bruised or “seconds” from markets or neighbors trees. I haven’t always asked what kind they are because I have discovered that as long as you use a good variety of apples, the end result is pretty darn good. If it is sour, add a sweetener, or cinnamon, or nutmeg… or whatever you like! Now, if that is absolutely not an option for you, then go ahead and do some research on the best kinds for saucing/canning. I do suggest you still get a variety to balance flavors. 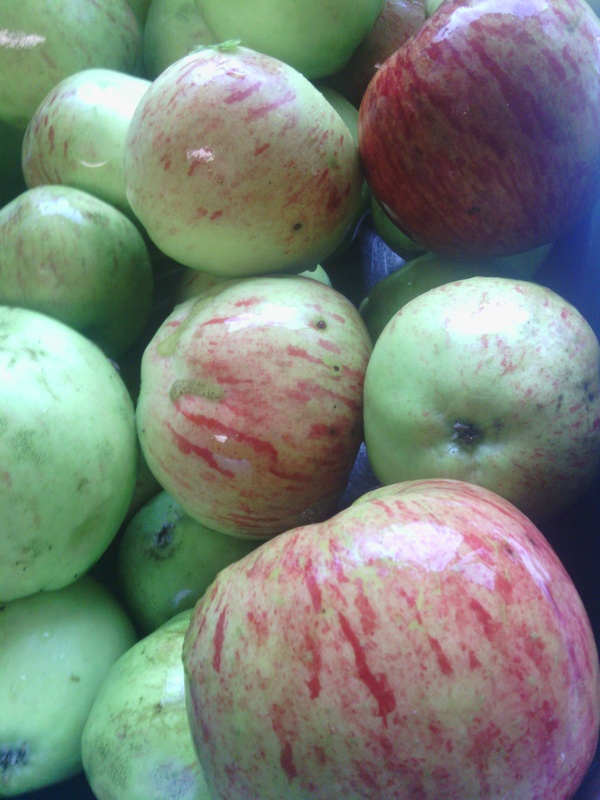 For our project, we met an eccentric farmer who shared multiple kinds of apples he grows organically. I told him we were new to area and wanted to obtain some in bulk form. He delivered! We ended up with 128 pounds of apples for 40.00! 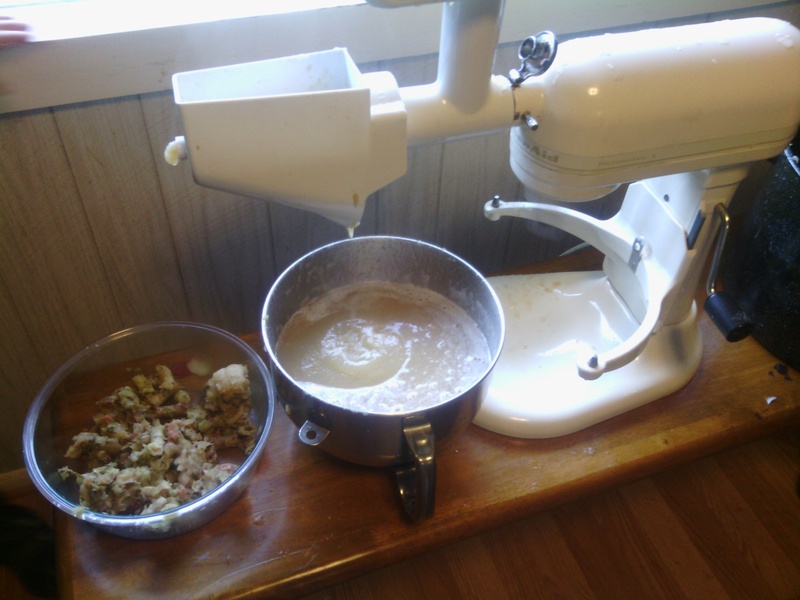 For making applesauce, the process is either very simple, or more complicated, but still simple (just more elbow grease!). I have an attachment that turns my handy dandy kitchenaide into a strainer. This means I do not have to peel or core my apples, it does that work for me. For chunky applesauce, I use the minnions children and put them to work! 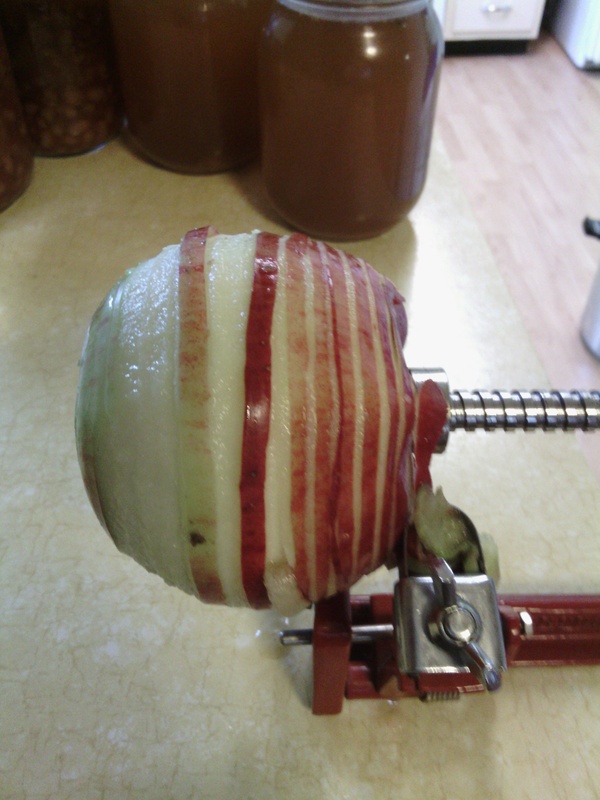 We do have a apple peeler/corer thingy. Here is my view after using three of them over the years. I don’t like them. However the kids LOVE them, so we break it out, it’s a big deal, everybody takes turns and about the time the juice is dripping everywhere, it’s sliding around the counter and the apples that aren’t perfect shaped are falling off, we give up. Then we move back to our handy veggie peelers and paring knives. However they do make for interesting looking apples! If you have a strainer, then its simple. Wash your apples up. Quarter them and drop them into the biggest pot you have. I have a pot almost as large as my waterbath canner. When its full, add 2-3 quarts of water (less if its a small pot), pop the top off and cook them until mushy! It may get a bit frothy on top, I just keep pushing the apples on top to the bottom until its good and soft everywhere! 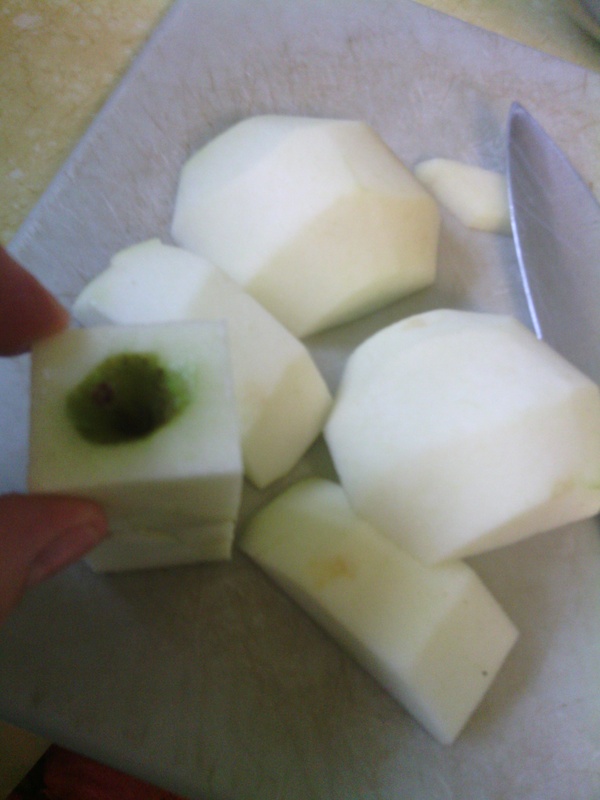 If you do not have a strainer, then you should peel and quarter your apples, then drop them into the biggest pot you have, add 2-3 quarts of water (less if its a small pot) and cook until they get bubbly and mushy! If your using the strainer… it will look something like this! The one complaint I have about the kitchenaide strainer is the height of it, which can make pouring the apples in difficult. We place it on the bench to compensate for that. Apples go into the top, sauce comes out one side, and the bowl next to the sauce holds the skins and seeds! 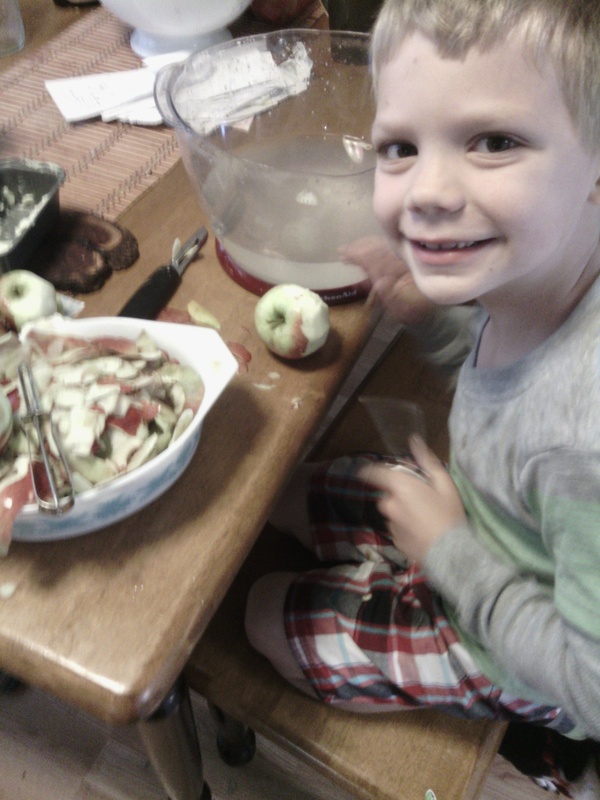 While that is bubbling away, you can work on your apple slices! I have perfected the way to make this easy (Ok, I didn’t really invent it but it makes sense to me!) 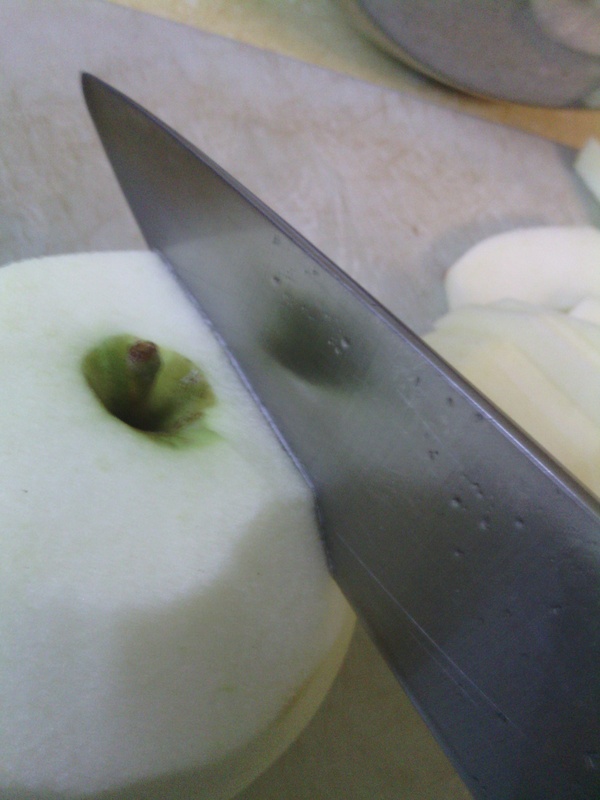 Peel your apples using the apple peeler, or a veggie peeler… knife… whatever works for your home. Drop the apples into a bucket of water with some lemon juice or fruit fresh to keep your color bright. Notice that I have some bruising on my apples? This is fine! It won’t affect the overall product. If it has a lot of bruising I would cut it off, but a little won’t hurt! Then the sides to make a fun little square. Ok. I’m easily amused. Forgive me…. 128 pounds of apples can do that. .
Then slice those cheeks and sides into slices. We prefer ours about 1/2 inch thick. Drop these back into the lemon water to keep the color. Make a light syrup however you want. I do 5 cups water, 1.5 cups rapadura (a natural sugar) OR 1.5 cups honey. I drop in approximately 2 tbsp. cinnamon and bring to a boil. 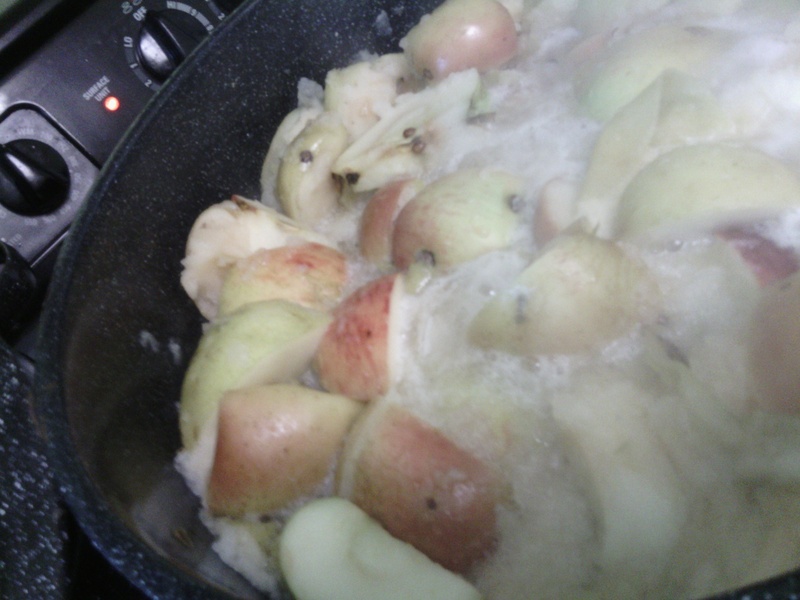 Once this is boiling add your apples and boil for five minutes. I have skipped this step before. Bad. Very bad. They puffed up and exploded all over, the texture was terrible. Don’t make bad choices. Friends don’t let friends raw pack apples. Please cook them five full minutes. Then, as with the applesauce, drop into hot jars, release all air bubbles, wipe the tops, add lids, and place into BWB for 20 minutes (pints and quarts ). Now, you have worked all day, you have a counter full of jars and you realize you have a bucket of cores and peels. You don’t want that to go to waste right?? Good thing you have options! 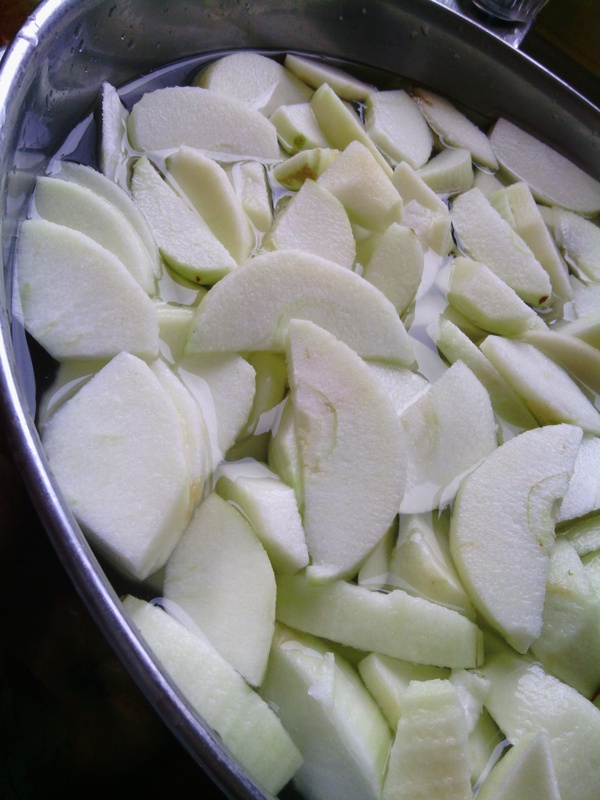 The first option is to make apple peel jelly, the second is to make apple juice. I would not recommend making this if your apples are not organic. Apples are one product that is highly sprayed with chemicals, and even with the best washing, you will not be able to get the chemicals gone. However, if you have organic apples, these are great options. Cover your apple cores and peels with just enough water to peek through the top layer. Simmer for approximately one hour until the peels and cores are disintegrated. Pour this through a colander or strainer to separate the liquid from the solids. For each cup liquid, add one half cup of sugar and one tablespoon lemon juice. Return to pot and boil until reduced and thick, stirring often, approximately 45 minutes. When this has reached the gel point (thickens on a frozen plate) then you are ready to pour into hot jars, cap with lids and process in a BWB for 10 minutes. I have found that we can SO much jelly that we ultimately don’t use the apple jelly. I am not sure why this is but it is. Instead, we take all the scraps and cover them in water, the same way you would do for jelly. We simmer it, then strain it through two colanders (one larger holes, one smaller). In the end we have apple “juice” which is more water then juice, but its flavored nicely and the kids think its pretty special! It also makes a good base for other canning projects! We usually drink this right up but you can also bring to a simmer, pour into jars and cap, then process in BWB for 20 minutes (pints and quarts). Last but not least, I did not post an apple butter recipe. I think this deserves a blog of its own. The short version? 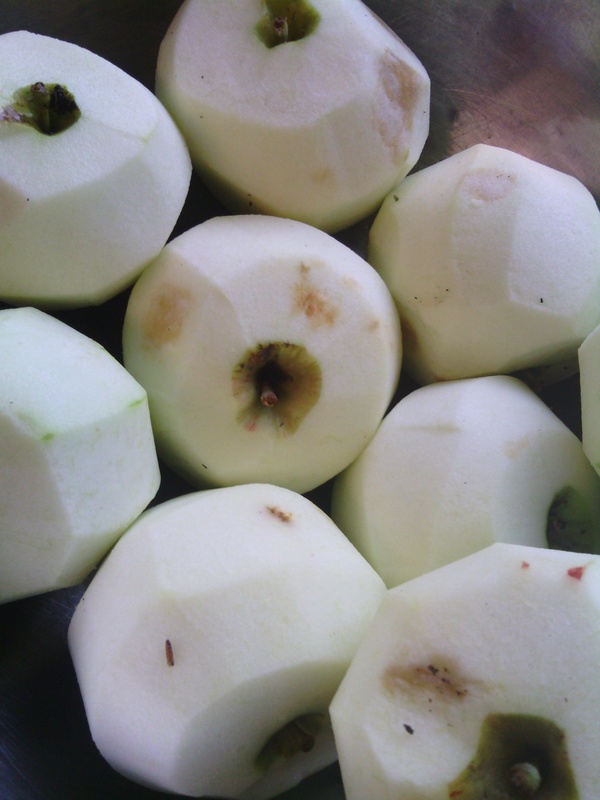 Chop you apples, peels and all, place in a crock pot, add 1-2 cups brown sugar, honey or rapadura and cook forever. When this breaks down to half, add some more, and some cinnamon, and nutmeg…. Blog to follow!